Happy Friday! Today on Somewhere Splendid, I’m sharing a few shots of a set up I put together in 15 minutes last night after bringing home a dozen peonies at the Minneapolis Farmer’s Market. I scored these beauties at $1 a stem – unbelievable! I paired it with some lamb’s ear that’s growing wild in my yard and used a hobnail vessel ($5 on sale from Urban Outfitters) and vintage creamers I had in my prop collection (bought as a set of 10 for $50, so also $5 a piece). The final total for the floral set up? $37. Awesome. Amazing! 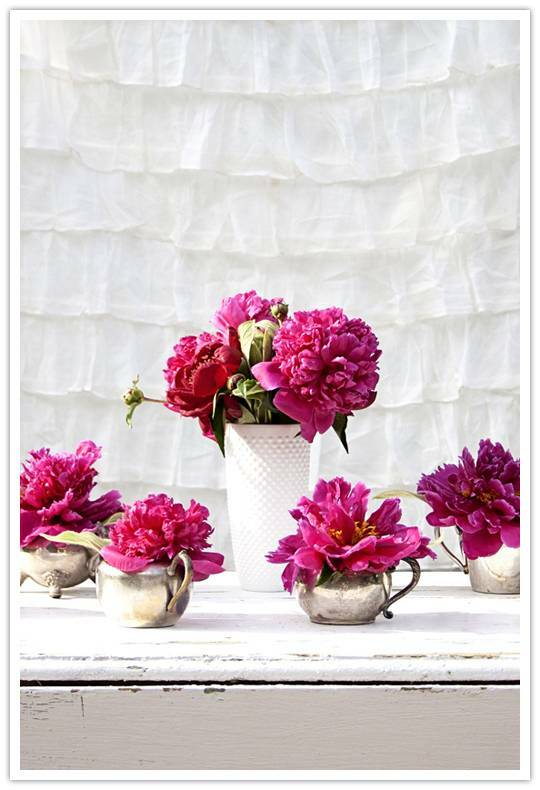 Peonies are my favorite and they look so elegant here. Well done! Very nice setup! I love the bright pink contrasted with the neutral white and rustic metal! Looks good Maddy! That raspberry color is so rich…that’s all you need…love Minneapolis Farmers Market. Always love peonies! And those containers you’ve used add such texture and character. So pretty! I love how you spread the peonies out with the metal creamers! Love this no matter how inexpensive it is, it’s gorgeous!